People are always fighting to be on top. I prefer being at the bottom. No one will try to take that distinction away from me. It’s mine for the keeping. Needless to say there will be Robot Monkey footage to follow. The final round was fierce— but Brooklyn won! *Who I want to thank wholeheartedly. You guys played a LOT better than I would have! Thanks! 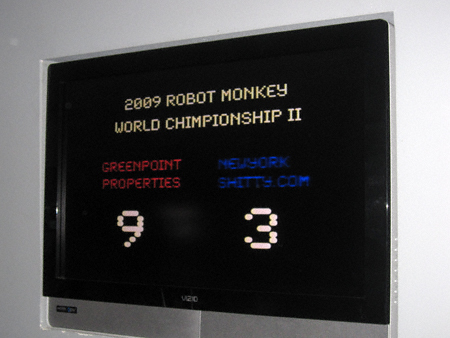 Tags: 11222, Dan Walker, Franklin Street, Greenpoint, Greenpoint Brooklyn, Greenpoint Properties, Robot Monkey World Chimpionship, t.b.d. To failure! And to this historic moment!